You are now wondering where is Uganda in al this, It's right on top of the game and the main reason Tanzania is at war with Kenya is Ugandan socialite, GENERAL Zari Hassan. "Babies ain't ATM machines, 2 baby daddies and you are proud, who does that ? You are not yet 30 and you have 2 baby daddies, what will happen when you turn 40, " Vera asked Hamisa. It all started with Diamond Platnumz' side chic, Hamisa Mobetto, who took off to Nairobi to flee from the scenes of Zari who was being showered with love the moment she stepped foot in Tanzania. While in Nairobi, Hamisa was picked up by BFF, Cuppie and in the company of other Nairobi slay queens, the girls hit B-Unit where they were partying all night long. The following day, Hamisa and the girls went to chill out at Dusit D2 in Nairobi and it's while there that they bumped into Vera Sidika cruising her white Range Rover Sport with KCH series, she was fresh from her birthday vac in Maldives. Cuppy signalled Vera to stop so she could say Hi and while at it, Hamisa was busy recording Vera on Snapchat behind a tintend window, this is where the drama started. "I honestly don't know what Hamisa's intentions were, please keep me out of your gossip and drama, Abeg a beg," Vera pleaded. "Saying that you want me to be your Veetox Ambassador in TZ, but I told you that I can't do it as I was pregnant with Dee's baby, " Hamisa shot back. "Don't make me embarrass you coz you know I got proof..." Vera replied promptly.. Trust, Hamisa who is good at keeping receipts, she very quickly went to her archives and retrieved incriminating evidence of Vera wanting to make shout outs of her on IG, this was a post dated August, 2014, to be exact, three years back, that Vera did not think it existed anyway. Hamisa is good at keeping her records, it did wonders for her when she pulled out all the evidence of Platnumz playing some hanky panky games with her, something that he had earlier denied. It's the same thing she did on Vera by pulling out a pic of her bare behind that she wanted Hamisa to promote on her IG, she also asked Hamisa to forward any of her pics that she could also run on her Instagram portfolio. After realizing that she had been undressed, Vera changed strategy by dropping the rubber bullets, she resorted to using live ammunition. "Babies aren't ATM machines. Bank babies are all you have. 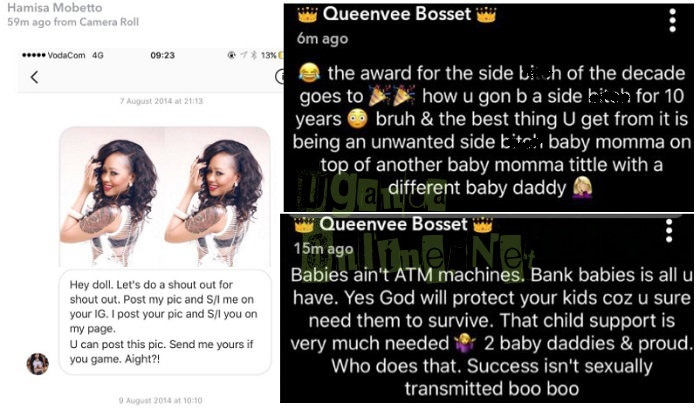 2 baby daddies and proud, who does that, success isn't sexually transmitted...the award for the side bi_-_ of the decade goes to..How are you going to be a side chic for 10 years," Vera posed a question..
Hamisa wraps up; "Keep throwing your unborn babies in the bushes and counting my baby papas. Just because you want to keep your Michael Jackson looks, or probably you don't know the men responsible. I'm not a baby killer, am a proud mother." This is just getting started, so watch that space! !